If your products have been imported from Inkthreadable they'll already be set up correctly. The product weight is one of the attributes imported into WooCommerce along with other product information, like the title and product mockup. If you created the products manually in WooCommerce you'll need to assign the recommended weights to them so that you charge your customers the correct amount for shipping. You can skip this step if you've imported your products. Head to the Products tab under WooCommerce and edit one of your product listings. Click the Variations tab, then open one of your variations. To match your WooCommerce store's shipping with Inkthreadable's you'll need to install a plugin to allow weight based shipping rates. There's no native way to do this in WooCommerce without a plugin, but we'll guide you through the installation and getting your shipping rates set up to match our own. First, you'll need to install a plug-in. There are a few options, but the one we're recommending is WooCommerce Weight Based Shipping by weightbasedshipping.com. The basic version is free to use. The easiest way to install the plug-in is through WordPress. Log in and click Add New under the Plugins heading. In the search bar, type WooCommerce Weight Based Shipping (or copy/paste) and hit return. The first result should be the one shown above. Click Install. Since we use weight based shipping, you'll first need to make sure your unit of measurement is set correctly. We use grams. Head to WooCommerce > Settings > Products and under the General tab you'll be able to change the Weight Unit. Select kg (for kilogrammes) from the drop-down menu and click the Save changes button. You can find the menu for editing your shipping rates under WooCommerce > Settings > Shipping. You'll find your new plugin listed underneath the shipping tab. Click the Shipping Zones link. 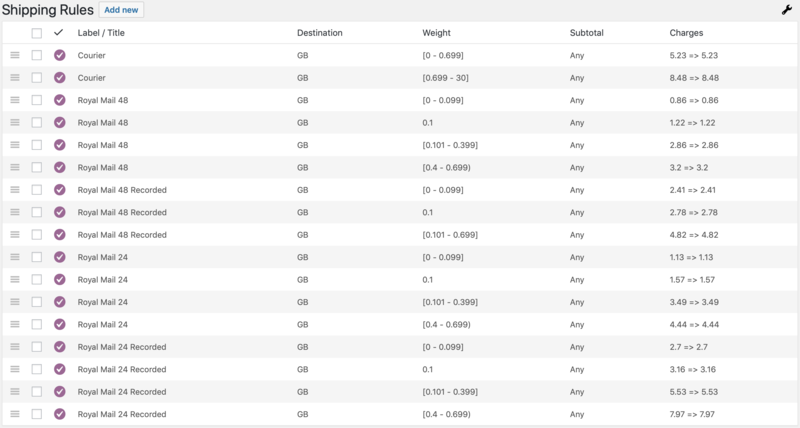 This is where we'll set up each shipping rate based on weight and destination. Inkthreadable's shipping rates can be found here. 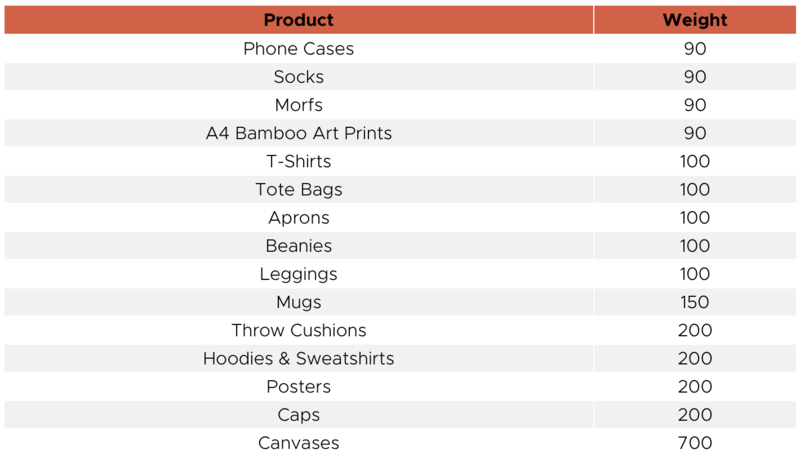 These are the prices we'll base shipping rates on in this guide, but it's worth remembering that you decide the amount your customer pays for shipping - simply use our shipping rates to decide your own. When setting up your shipping rates it’s important to make sure they include the correct keywords for each shipping method. Our system looks for these when an order is received from your WooCommerce store so to avoid mistakes we always advise these keywords be used for each shipping method. Using these keywords is as simple as including them in the Label/Title field for each shipping rate you set up. We'll start with adding rates for all shipping methods to the United Kingdom. Since these are based on weight, there are multiple rates for the same shipping method. To enter your first method, click the Add Shipping Zone button. Enter United Kingdom as the Zone Name, add United Kingdom to the Zone Regions and click the Save changes button at the bottom of the page. You've now created a zone for the UK, and we'll now populate this zone with rates for UK shipping. 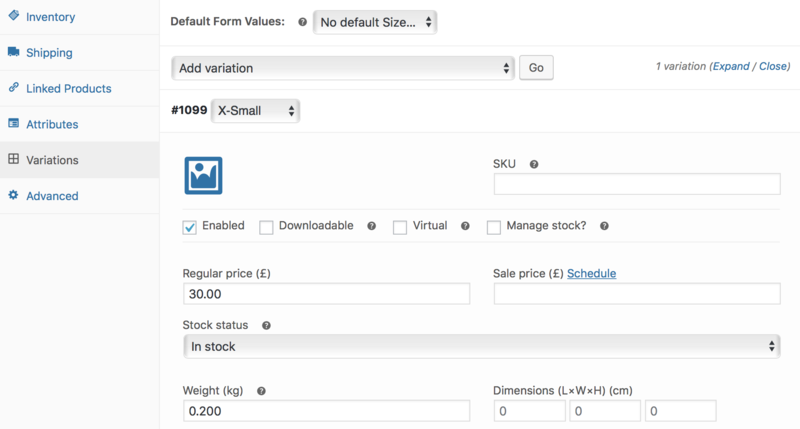 Click Add shipping method and select Weight Based Shipping from the drop down menu. You'll see a new shipping method appear in the table. Click edit to open the shipping method and make some changes. Select the Define new rules button. It'll tell you there are no shipping rules defined, so let's define some! We'll start by creating rules for the Regular shipping method, and use Royal Mail 48 as an example. Click the Add new button. 'Royal Mail 48' as the Label and Title. The keyword we look for for this shipping method is '48', so make sure this is in the Label field. You can enter anything you like for the Title field, but since the service name 'Royal Mail 48' says exactly what it is, it might be best to stick with this. Scroll down a little to define the destination and weight. Change the Destination to Specific and select United Kingdom. The order weight should be 0.00 to 0.099 kg, and check the 'or equal' box. When you're finished, click Close. This will save the changes you've made for this rate. This rule will now add £0.86 for shipping when your customer comes to your checkout, as long as their items weigh between 0 and 0.099 kg and they have selected the Royal Mail 48 shipping method. Rates for the UK are now set up! You'll notice that one of the Courier rates is actually cheaper than some of the Regular and Recorded rates. This isn't a mistake - our Courier service can ship parcels lighter than 0.699kg for £5.23 for orders shipping to the UK. This is where things get a little tricky. We've split Europe into 5 Zones to offer the cheapest Courier rates possible for each country, but this means you'll need to add some extra rates for country specific zones. But don't worry, it sounds more complicated than it is! First, head back to your Shipping zones. If you're not sure how you can click back to the Settings tab of your WooCommerce dashboard, then click the Shipping tab on the top menu. Head back to the Shipping zones tab and click the Add shipping zone button. The Zone name is Europe and the Zone regions will include all the countries that we're about to manually input. Click into the Zone regions box. 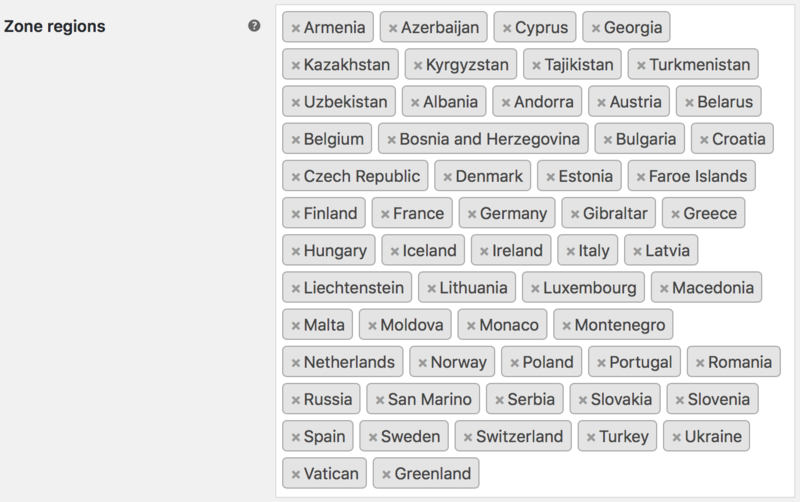 You'll now need to enter each country manually. The list of all European countries is below and, unfortunately, you can't copy/paste this list since you can only enter one country at a time. Albania, Andorra, Armenia, Austria, Azerbaijan, Belarus, Belgium, Bosnia and Herzegovina, Bulgaria, Croatia, Cyprus, Czech Republic, Denmark, Estonia, Faroe Islands, Finland, France, Georgia, Germany, Gibraltar, Greece, Greenland, Hungary, Iceland, Ireland, Italy, Kazakhstan, Kyrgyzstan, Latvia, Liechtenstein, Lithuania, Luxembourg, Macedonia, Malta, Moldova, Monaco, Montenegro, Netherlands, Norway, Poland, Portugal, Romania, Russia, San Marino, Serbia, Slovakia, Slovenia, Spain, Sweden, Switzerland, Tajikistan, Turkey, Turkmenistan, Ukraine, Uzbekistan, Vatican. Scroll down a little and click the Save changes button and then add a new shipping method with the Add shipping method button. Select Weight Based Shipping from the list. Click the Add new button. Just like with the UK rates we'll now set up the first shipping rate for Europe. Enter 'Regular' in the Label field, and 'Royal Mail 1st Class' as the Title. Scroll down. The Destination should be 'All allowed', and the weight range for this first rate needs to be 0 to 0.1 kg. Scroll down further to enter your Base Cost. We'll use £3.92 here, but you should enter what you want your customers to pay. Click the Close button. Next, we'll add the rates for Courier shipping to Europe. This is where our 5 Zones come into play. Within this Shipping Zone for Europe we'll create 5 new Shipping Rules, and each rule will add Courier shipping for a specific set of countries. Click the Add new button. The Label and Title should both be 'Courier'. You could enter DPD in the Title field if you wanted to, but since DPD work with different delivery partners throughout Europe it's likely not going to be DPD who deliver to the shipping address. 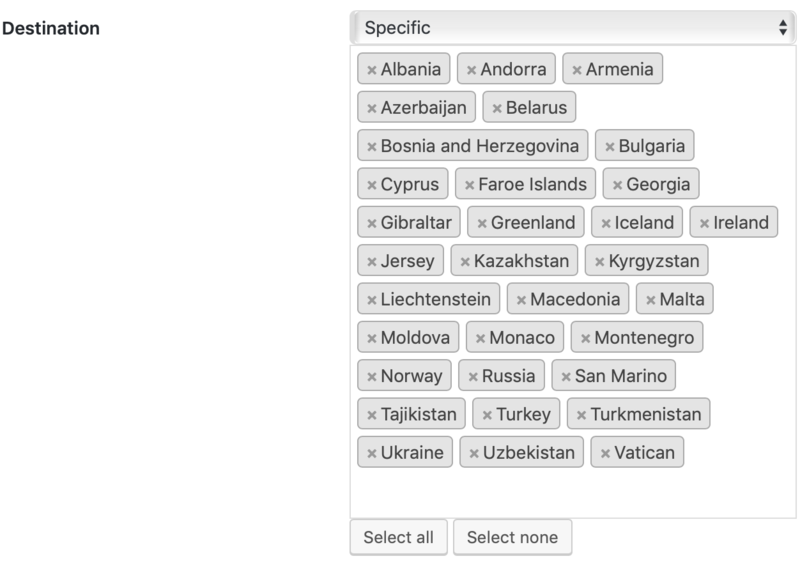 Scroll down to set the Destination countries. At this point, it might be helpful to familiarise yourself with the zones listed on our Shipping Costs page may come in handy. 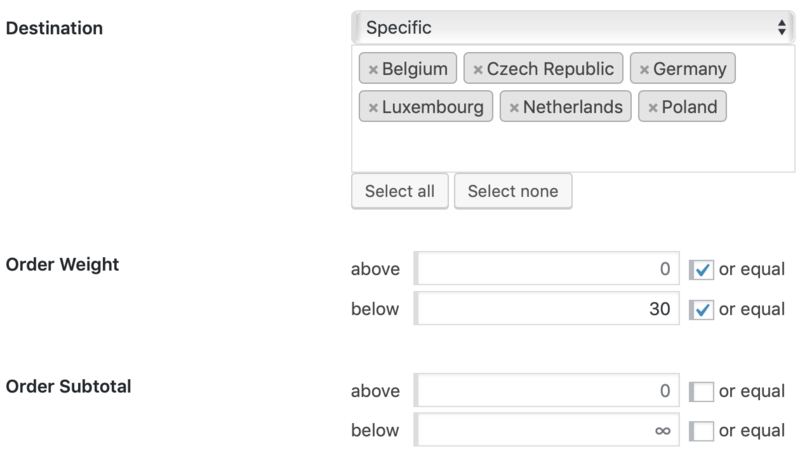 Click the dropdown to change the Destination to 'Specific', and then select the six countries listed for Zone 1 on our Shipping Costs page: Poland, Germany, Czech Republic, Netherlands, Belgium & Luxembourg. Change the Order Weight range to 0 to 30 kg. Finally, scroll down and add the price you want your customers to pay in the Base Cost field. We've used Inkthreadable's rate of £8.70 for this. Click the Close button. You'll see this new rate listed, with the specified countries next to it. Zone 5 will be slightly different. This zone includes any European countries that are not covered by zones 1 to 4, but there is no way to define this quickly. Instead, duplicate one of the previously completed rules for Courier. Albania, Andorra, Armenia, Azerbaijan, Belarus, Bosnia & Herzegovina, Bulgaria, Cyprus, Faroe Islands, Georgia, Gibraltar, Greenland, Iceland, Ireland, Jersey, Kazakhstan, Kyrgyzstan, Liechtenstein, Macedonia, Malta, Moldova, Monaco, Montenegro, Norway, Russia, San Marino, Tajikistan, Turkey, Turkmenistan, Ukraine, Uzbekistan & Vatican. Scroll down and change the Base Cost to what you'd like your customers to pay (we're using Inkthreadable's rate of £22.75) and then click Close. Make sure you click the Save changes button at the bottom! And that's it. Your rates for Europe are completed! Head back to your shipping zones. We'll start by creating a zone to cover the US. Click the Add shipping zone button. Enter US as the Zone Name, and select United States as the Zone Region. Click the Add shipping method button, select Weight Based Shipping from the drop down menu, and then click the button to add the new method. Click to edit this new method, then click the Define new rules button. The rates for shipping to the USA are based on a new service introduced in March 2019, where parcels shipped from Inkthreadable are injected straight into the USPS delivery network. It speeds up shipping times and lowers shipping costs all in one go! There's only one rate for this, we won't be offering 'Regular' and 'Recorded' — as standard, all parcels shipped to the US will be tracked. You'll now need to set up two delivery methods for the US, one for this service and one for Courier. Click the Add new button to add your first rule. The Label should be 'USPS' (this is the keyword we're looking for) and the Title should be something like 'USPS (Recorded)' to let the customer know what service it is. Scroll down to the Destination. Select 'Specific' from the drop down menu, and then add United States. The first weight range for this delivery method is 0 to 0.099 kg. Scroll down to the Base Cost and enter what you'd like your customers to pay. Inkthreadable's rate for this is £4.31. Click the Close button. As you're working through these you'll notice the rate for 0.101 - 0.199 kg is higher than for those following it. This isn't a mistake. We've made the rates as cheap as possible, but each weight bracket cost is based on both weight and parcel size. Next, we need to add the Courier rate for the US. Click the Add new button. The Label and Title should both be 'Courier'. 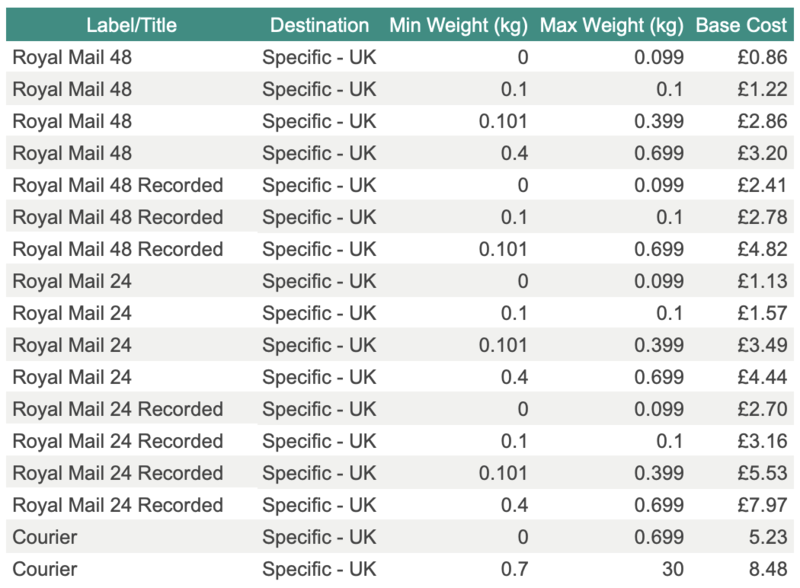 The Destination should be 'Specific' to the United States, and the weight range is 0 to 30 kg. Inkthreadable charge £36.00 for this rate so this is what we've used. Click the Close button, and that's your rates for the USA completed! Remember to click the Save changes button to save your work here, or you'll have to do it all again. Head back to your shipping zones. You'll see a zone that covers all countries that have not been defined in a previous zone; we'll use this to complete the rates for the rest of the world. Click to edit this zone, and then click Add shipping method and select Weight Based Shipping from the drop down menu. You'll see a new shipping method appear in the table. Click edit to open the shipping method and make some changes. Select the Define new rules button. There are three services that ship to the rest of the world: 'Regular', 'Recorded', and 'Courier'. We'll need to set up rates that cover each of these. There are fewer weight brackets than for Europe though, so it's not a lot of work. We're on the home stretch. Click the Add new button to add your first rate. The Label should be 'Regular' and the Title should be 'Royal Mail 1st Class' to let your customer know which service will be used. You can leave the Destination as 'All allowed', and the weight bracket for the first rate is 0 to 0.1 kg. Enter what you'd like to charge for the Base Cost - we'll use Inkthreadable's rate of £5.01. Click the Close button. Next, repeat this process for each rate in the table below. Make sure you click the the Save changes button! And that's it! Your WooCommerce shipping rates are now complete.